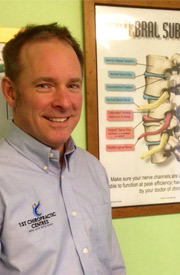 Yateley Chiropractor Robert J. Gruhn D.C. Welcome to 1st Chiropractic Centres! We hope you enjoy your visit. Robert J. Gruhn, Doctor of Chiropractic, attended Life University of Chiropractic, in Marietta, Georgia, USA. He graduated in 2001 and has been in Camberley, Surrey helping the community through chiropractic care ever since. There May Be A Better Way! Dr. Gruhn believes that most people can benefit from chiropractic care, regardless of their age. In this day and age, too many people seem to rely on taking pain pills to get them through a day, not knowing that there may be a better way of life through chiropractic care. Rob is married to Pam, who is the practice manager. They have a Great Dane called Ruby who occasionally ‘pops’ in to the practice to say ‘Hello’. Rob enjoys sport and plays golf regularly as well as kickboxing and Brazilian Jiu Jitsu. Thanks for visiting our site, have a look around. Then, if you decide chiropractic may be an option for you, give our Yateley practice a call or email us using the link below and let’s arrange a time convenient for you, to come in and have a FREE consultation. Yateley Chiropractor Emma Scullion D.C.
Dr Emma Scullion graduated from the Anglo-European College of Chiropractic with a Masters Degree in Chiropractic. Emma first encountered the power of Chiropractic many years ago after suffering an injury to her back, and being successfully treated by a Chiropractor. 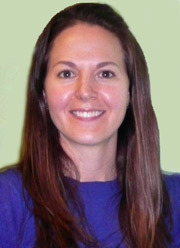 The natural philosophy and effective treatment techniques behind Chiropractic practice inspired her to become part of this dynamic profession. Emma has strong beliefs in achieving optimum health through optimising function. Dr Scullion enjoys treating a wide spectrum of complaints from headaches and neck pain to low back pain and problems specific to pregnant women and paediatric patients. She also has a special interest in treating post-operative patients, optimising their road to recovery. Concerned primarily with patient care, Emma finds it important to increase her patients’ knowledge of Chiropractic. She is a great advocate of keeping your spine healthy in order to enable your whole body to work at its optimum; this introduces her patients to a lifestyle philosophy within which their symptoms and pain complaints are improved. Chiropractic not only aims to solve individual and physical problems, it can also play a major role in the promotion of reduced stress and improved mental well being; focusing on treating the cause of aproblem, not the symptoms. Call our Yateley office to arrange a time so that we may meet you and discuss your particular health issue. 01276 681555.